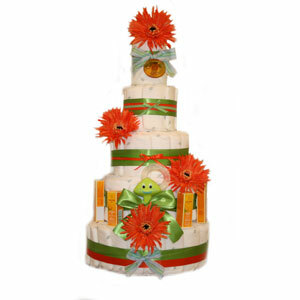 Exclusive to GrowInStyle, our Organic 5 Tier Green Extravaganza Diaper Cake is truly one of a kind masterpieces. Baked with the purest and most Eco Friendly ingredients, our diaper cake makes the best baby gift a parent can receive when welcoming a new baby into the world. Use as a centerpiece at a baby shower and Green Extravaganza will be the hit of the party. A perfect way to express a "Go-Green" baby shower theme. Guests will be dazzled by the beauty and uniqueness of this beautiful 5 Tier creation. To upgrade this cake, please select the option "Diaper Cake Upgrade" below.